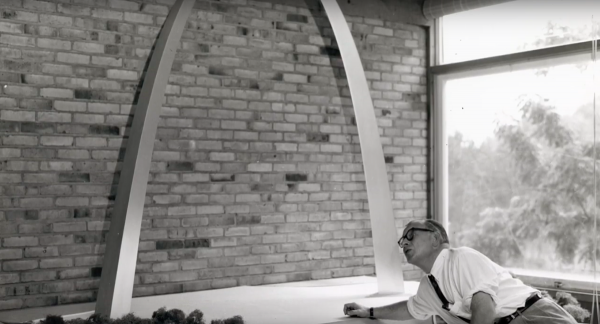 The film explores the life and visionary work of Finnish-American modernist architectural giant Eero Saarinen (1910-1961). Best known for designing National Historic Landmarks such as St. Louis’ iconic Gateway Arch and the General Motors Technical Center (Warren, Mich.), Saarinen also designed New York’s TWA Flight Center at John F. Kennedy International Airport, Yale University’s Ingalls Rink and Morse and Ezra Stiles Colleges, Virginia’s Dulles Airport, and modernist pedestal furniture like the Tulip chair. His sudden death at age 51 cut short one of the most influential careers in American architecture. Saarinen’s son, director of photography and co-producer Eric Saarinen, ASC (Lost in America, The Hills Have Eyes, Exploratorium), visits the sites of his father’s work on a cathartic journey, shot in 6K with the latest in drone technology that showcases the architect’s body of timeless work for the first time. The documentary also features rare archival interviews with Eero and his second wife, The New York Times art critic Aline Saarinen, as well as letters and quotations from Aline’s memoirs voiced respectively by Peter Franzén and Blythe Danner. Film: 2016, Dir. Peter Rosen, 70 mins, English. Subscriptions are now available to purchase for the 6 sessions throughout the year held in the lounge room of Robin Boyd’s Walsh Street House.